Deliver DEPCO, LLC’s curriculum including Science; Business, Marketing, and IT; Career Explorations; Family and Consumer Science; and Industrial Automation and Pre-Engineering, or customized content and new courses, via DEPCO Studio. Scheduling, grading, and communicating with students is no longer a complicated process. DEPCO Studio assists instructors by simplifying the classroom management experience. Creating a student, class, or course is accomplished with only a few clicks of the mouse. Sending a message to a student or class and announcing new curriculum schedules can easily be accomplished using DEPCO Studio. 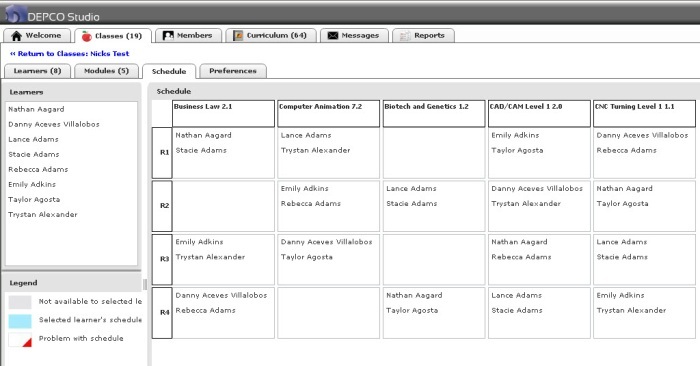 Automatic scheduler handles scheduling conflicts, student preferences, grouping, etc. DEPCO Studio incorporates many instructor friendly features that allow students to learn what you want emphasized. DEPCO Studio enables instructors to modify current DEPCO, LLC curriculum or create their own curriculum for students to view. Instructors completely control the content, tests, and grading scale in DEPCO Studio. 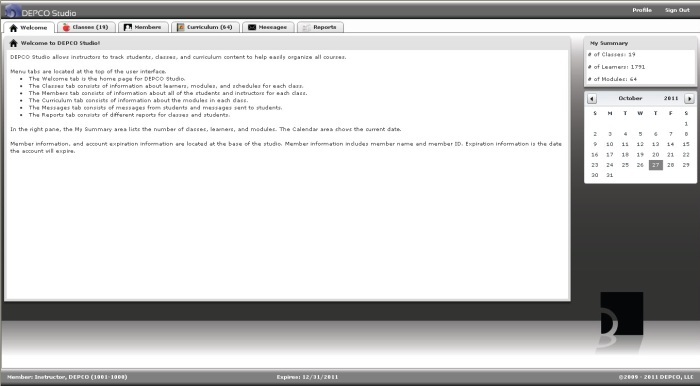 The content delivery system tracks students’ progress and logins while guiding them through multimedia curriculum. Instructors can also attach documents such as manuals and supporting files to the curriculum for the students to view and download. Because DEPCO Studio is an online platform, multiple students can login to view the same curriculum independently or simultaneously, and their progress is still tracked. "The students use one program to view media, use the workbook, and take tests. You can also access the program while the students work. This program helps alleviate the confusion caused from using multiple items." "I liked the program all together because instead of going to a book and carrying that book around, it was right on a computer. Overall, the program was great!"